The speaker at our next meeting will be Debby Matthews, who will give an illustrated talk entitled ‘A tour around Gideon Mantell’s Lewes’, based on Mantell’s original guide-book to Lewes. Mantell’s book was in turn based on a visit back to his home town in 1846. He describes the town as it was during his childhood in the 1790s, and as it developed during the years in which he practised medicine at Castle Place. 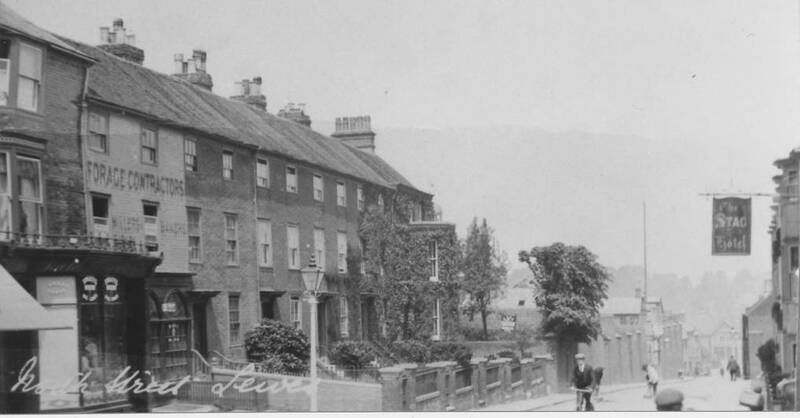 Mantell grew up in St Mary’s Lane [now Station Street], and Debby now lives in the house in which he was born. Debby has many other roles in Lewes, including Director of the South Downs Council for Voluntary Service, newsletter editor for the South Street Bonfire Society, a town tour leader, member of the Oyster Project team and presenter on Rocket FM. 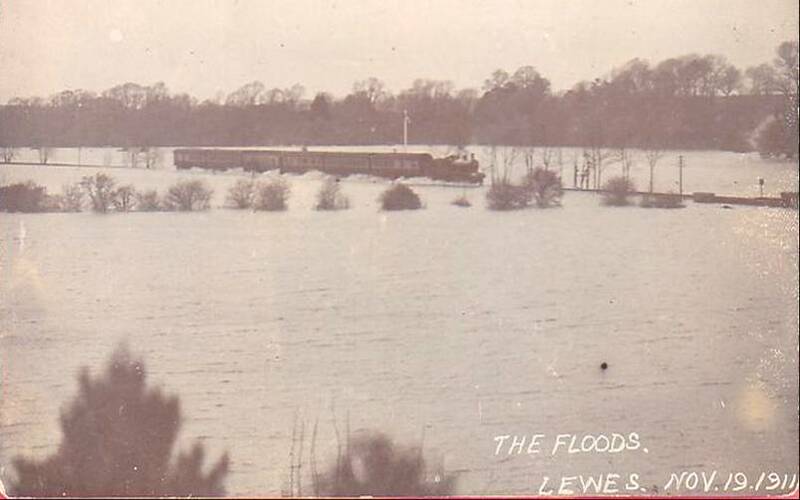 This postcard, offered for sale last year on ebay, shows a steam engine creating a substantial bow wave as it pulls a train across the flooded Malling Brooks. Would today’s electrified railway service prove so resilient? Silly question! Nearly two centuries ago the elegant Dial House in the pedestrian precinct was a Quaker school for young ladies. The Quaker businessman John Godlee had four daughters, and when in 1826 a friend died, Godlee’s wife suggested that the friend’s two motherless children should be taken in and educated by her daughters. The school grew from this small beginning to have 20 pupils. Quaker education was thorough, encompassing reading aloud, an emphasis on correct spelling and writing in a good clear hand. The syllabus included geography, grammar and of course scripture, with enough French to be able to read a book and some Latin. Hymns and poems were committed to memory. Excellent needlework was considered important, and the girls made garments for the poor. The Friends did not approve of music, so that was not taught, but painting was an admired accomplishment. The girls were a visible presence in the town, walking two by two from the school and along Friars Walk for meditation and worship at the Friends Meeting House. Sources: The July 1934 ‘Sussex County Magazine’ and John Eccles’ column in the 2 Oct 2009 Sussex Express. In his recent article on Tom Paine in Lewes, Colin Brent noted in passing that in January 1769 Elizabeth Ollive had advertised the opening of a new school for young ladies in Lewes High Street. Elizabeth Ollive had been born in 1749, so was herself still a minor at this time, but she did have some experience – she had previously taught in Miss Ridge’s school. The Ridges were at this date the principal family supporting the Westgate Chapel, and the Ollives also attended Westgate, immediately adjoining their shop. The new school was perhaps intended to replace Miss Ridge’s school, which had closed on her retirement. This new venture was short-lived. Six months later Elizabeth Ollive’s father died, and she took over his shop, in partnership with Thomas Paine. In 1771 the couple were married. This account comes from the Rev Thomas Walker Horsfield, minister of Westgate Chapel. The jail he is describing is the one on North Street, built in 1793 and extended to 70 cells in 1817. He notes that, compared with former times, and with some contemporary prisons, the discipline of the prison was excellent. He ascribed this to the gaoler, Mr Jones, who united affability and benevolence with firmness of decision and character. Horsfield thought it might be even better if the interactions between prisoners, allowed under existing regulations, were done away with. “Good cannot be expected to result from a communion of vicious characters. They necessarily corrupt each other by association.” Horsfield, who was of course minister of Westgate Chapel, also recorded that three years previously some benevolent ladies had proposed forming a society to visit the female prisoners, instructing them in needlework and other domestic duties and teaching them to read the scriptures. However, this proposal had come to nothing, “because the doctrines of the Church of England were not to be exclusively impressed on the prisoners “. This postcard shows the pre-war view down North Street, with the Stag Hotel sign on the right. The shop on the far left survives, but the terrace beyond had to be demolished after the German bombing raid. The telephone exchange and the new police station now occupy the space. Beyond these houses is part of the 1793 prison, at this date taken over by the Royal Navy. The fire station can just be made out at the end of North Street. Re Cliffe Fair (Bulletin no.5). I have had the privilege of reading the Charter at the fairs still held every year at Cliffe Church. To add a friend to this email distribution list, please send their email address back to me. To unsubscribe from this list, please reply to this email, changing the email title to ‘Unsubscribe’. Please remember that next month’s meeting will be on the 3rd Monday, rather than our usual date. This is to avoid a clash with Valentine’s Day. There will be no research group meeting in February. For our full 2011 programme see Meetings page. This entry was posted in Education History, Legal History, Lewes, Local History, Social History and tagged education, floods, Gideon Mantell, John Godlee, Lewes Gaol, Lewes Jail, North Street, prisoners, Quakers, schools. Bookmark the permalink.